For other people named Harold Reynolds, see Harold Reynolds (disambiguation). Harold Craig Reynolds (born November 26, 1960) is an American former professional baseball second baseman, who played in Major League Baseball (MLB) for the Seattle Mariners, Baltimore Orioles, and California Angels. Since his retirement, he has become a well-known television analyst, working for MLB Network and Fox Sports. Born in Eugene, Oregon, Reynolds was raised in Corvallis and starred in football, basketball, and baseball at Corvallis High School. He was a member of the state championship (AAA) football team in 1978, graduated in 1979, and was inducted into the Oregon Sports Hall of Fame in 1998. He was a member of Corvallis' American Legion baseball team that won state and regional titles in August 1978. Although Reynolds was selected in the 6th round of the 1979 amateur draft by the San Diego Padres on June 5, he elected not to sign and played college baseball at Cañada College in Redwood City, California. In the 1980 draft on June 3, Reynolds was selected in the 1st round (2nd pick) of the amateur draft (Secondary Phase) by the Seattle Mariners. On June 1, 2013 Reynolds was inducted into the Cañada College Hall of Fame and was presented with the "Colts Lifetime Achievement Award". Reynolds spent several seasons in the minor leagues, playing for the Wausau Timbers (A) in Wisconsin in 1981, Lynn Sailors (AA) in Massachusetts in 1982, and Salt Lake Gulls (AAA) in Utah in 1983, prior to his major league debut on September 2, 1983. During his time in the minors, Reynolds learned how to switch hit by working with minor league manager and former Big Red Machine catcher Bill Plummer. The following season, he played AAA ball in Salt Lake before being called up again in September 1984. The 1985 season was his official rookie season in Major League Baseball when he played for the Seattle Mariners. Reynolds was an All-Star in 1987 and 1988, led the American League in stolen bases with 60 in 1987, in triples with 11 in 1988, and in at-bats with 642 in 1990. He was the only player other than Rickey Henderson to lead the American League in stolen bases during any season in the 1980s. In 1986, he played in Puerto Rico with the Mayagüez Indians. In 1991, Reynolds won the Roberto Clemente Award, given annually to a Major League Baseball player selected for his character and charitable contributions to his community. On Oct. 26, 1992, Reynolds was granted free agency and signed with the Baltimore Orioles that December. After one season with the Orioles, he again entered free agency on Oct. 29, 1993. Reynolds signed with the San Diego Padres on Jan. 28, 1994, before being traded to the California Angels that March for Hilly Hathaway. The 1994 season was Reynolds' final season in the major leagues. During a 12-year baseball career, Reynolds batted .258 with 1,233 hits and 353 runs batted in. A superb fielder, Reynolds regularly led the league in double plays turned and won three Gold Glove awards for his play at second base. Reynolds was a lead studio analyst on ESPN's Baseball Tonight from 1996–2006. He would appear at major baseball events on the ESPN set including the All-Star Game and the World Series. He also was a commentator for ESPN's coverage of the College World Series and Little League World Series. He was also a two time winning coach in the Taco Bell All Star Celebrity Softball game held during the MLB All Star break. He was known for telling his players to "let it all hang out." 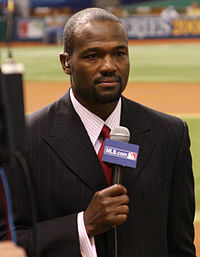 On July 24, 2006, Harold Reynolds was fired from ESPN. The ESPN spokeswoman confirmed that Reynolds "is no longer with the network" but did not give a reason for the departure. "Three people who work at ESPN and familiar with the case said the cause was a pattern of sexual harassment." Reynolds called this incident "a total misunderstanding" and that "I gave a woman a hug and I felt like it was misinterpreted." It was announced on October 30, 2006, that Reynolds planned to sue ESPN after having tried "everything possible to handle this situation quietly behind the scenes", while stating that he is seeking the money owed to him under the remainder of his contract, including interest and lost earnings. The Smoking Gun obtained a copy of Reynolds' contract that was filed as part of the lawsuit. Reynolds' lawsuit is for $5 million, roughly equivalent to the value of the contract Reynolds signed that was scheduled to cover the 2006–2011 seasons. ESPN settled the case in April 2008, giving Reynolds a seven figure settlement (Portland Tribune, April 29, 2008). On June 11, 2007, Reynolds officially joined MLB.com as a baseball commentator. Reynolds settled his lawsuit with ESPN on April 16, 2008. Nine days later, Reynolds officially joined Mets pre-game and post-game coverage on SportsNet New York as a baseball commentator. Reynolds also worked with TBS on their Sunday baseball telecasts, as well as the 2008 MLB Playoffs. Since its launch on January 1, 2009, Reynolds has been an analyst on MLB Network. Reynolds regularly appears on MLB Tonight, Quick Pitch, Diamond Demo and MLB Network's breaking news and special event coverage, including the All-Star Game, Postseason and World Series. In the baseball off-season he is the co-host of the daily morning show Hot Stove, along with Matt Vasgersian. Reynolds was nominated for a Sports Emmy Award for his work as a studio analyst on MLB Network in 2010 and 2011. Reynolds became a member of the MLB on Fox pregame show in 2012, which at the time was being produced out of MLB Network's studios. Reynolds worked on Fox's pregame show for two years alongside Matt Vasgersian and Kevin Millar. With the retirement of Fox's lead analyst Tim McCarver following the 2013 season, Reynolds, along with Tom Verducci, was promoted to join Joe Buck on the network's top broadcast team. Fox decided to replace Reynolds and Verducci with John Smoltz for the 2016 season. Reynolds provides an in-game tutorial on how to hit, field, and pitch in the Triple Play Baseball and MVP Baseball series. He has also started an organization called HR Enterprises. Reynolds' brother Don is a former outfielder who played parts of two seasons with the San Diego Padres. On a November 2018 episode of Hot Stove, Reynolds mentioned that he is the youngest of 8 children. ^ Bellamy, Ron (February 11, 1994). "Second chance is all he seeks". Eugene Register-Guard. Oregon. p. 1B. ^ "Six new inductees join Oregon Hall of Fame". Eugene Register-Guard. Oregon. June 30, 1998. p. 2D. ^ "Corvallis upends Yakima for title". Ellensburg Daily Record. Washington. UPI. August 28, 1978. p. 6. ^ Kragthorpe, Kurt (June 15, 1983). "Owen-Reynolds combination clicks". Deseret News. Salt Lake City, Utah. p. 8B. ^ "Reynolds out at ESPN". Associated Press. 2006-07-25. Retrieved 2006-07-25. ^ "ESPN's Reynolds let go over sexual harassment". 2006-07-26. Archived from the original on 2006-11-07. Retrieved 2006-07-26. ^ Marchand, Andrew (2006-07-26). "Accused of Sexual Harassment: Reynolds Wants ESPN Job Back". New York Post. Archived from the original on 2006-08-19. Retrieved 2006-07-26. ^ "Reynolds sues ESPN for $5 million". Retrieved 2007-10-19. ^ Sandomir, Richard (February 8, 2007). "Reynolds's Pact Is Included in Amended ESPN Suit". The New York Times. Retrieved May 4, 2010. This page was last edited on 10 April 2019, at 21:10 (UTC).